Zopiclone belongs to a group of medicines called hypnotics. It is a fast acting sleeping tablet and is prescribed primarily to help with short term sleep problems. Zopiclone may be prescribed to help with sleep problems such as difficulties falling asleep, staying asleep or waking up too soon or early. Zopiclone is also sold as Zimovane and Imovane. Are you allergic to Zolpidem/Zopiclone or any other hypnotic medication, including any of their other ingredients? Are you suffering from mild/transient insomnia? Please provide a full history of your symptoms. Include any diagnosis you have had regarding sleep issues and when you were last seen by your GP. Have you taken hypnotic drugs before? If so, did you respond well to the drugs? Have you used any hypnotic medication other than the one selected today? Are you using this drug in short spells? e.g. taking breaks up to a few days in between usage and taking half tablets when appropriate? Please confirm you have read and understand our Hypnotics prescribing policy. The hypnotics prescribing policy can be found here. What is Zopiclone and what does it do? Zopiclone belongs to a group of medicines called hypnotics. It is a fast acting sleeping tablet and is prescribed primarily to help with short term sleep problems. Zopiclone tablets may be prescribed to help with sleep problems such as difficulties falling asleep, staying asleep or waking up too soon or early. Zopiclone works by affecting the GABA receptors in the brain. GABA, which has a sedative effect, can be found naturally in the brain. Zopiclone helps you sleep by increasing the sedative effect of GABA. Zopiclone is linked to a risk of dependence. To reduce the risk of dependence, always follow the recommended dose and never take this medicine for longer than the doctor's instructions. When is Zopiclone tablets prescribed? Zopiclone can be used to help patients who suffer from temporary, and in certain cases, longer lasting insomnia. Zopiclone, which can also be prescribed under the branded name Zimovane, should help you sleep without leaving you feeling drowsy the next day. In adults, Zopiclone and Zimovane can be used for up to 4 weeks if considered suitable by the doctor. Zopiclone will usually be prescribed for less than 4 weeks, as prolonged use may cause the medicine to not work as well and you may become dependent. Is Zopiclone suitable for my condition? 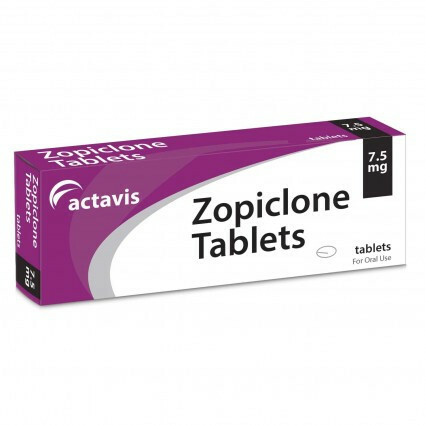 The doctor will determine the suitability of Zopiclone based on your medical history as well as whether you take any other medicines, supplements or over the counter drugs as these may change how Zopiclone works. If you are allergic to Zopiclone, Zimovane or any of the ingredients listed in the patient information leaflet. If you suffer from myasthenia gravis. If you have any breathing problems, especially during sleep (sleep apnoea). If you suffer from respiratory failure. If you have severe liver or kidney problems. It is important that you tell the doctor through the medical questionnaire if you: have a personality disorder, have ever been or are currently being treated for drug or alcohol abuse, think you may not be able to stop taking Zopiclone to treat your sleep problems or are 65 years of age or older as there may be an increased risk of side effects. What is the recommended dosage of Zopiclone tablets? You should follow the doctor’s instructions on how to take this medicine. The doses outlined below is for your reference only. Swallow the tablets whole with a small glass of water. The recommended dose for adults with sleep problems is one Zopiclone tablet per day. Take the tablet just before bedtime. The recommended dose for the elderly is half a tablet (3.75mg) per day. Take half of one tablet just before bedtime. The recommended dose for patients with liver or kidney problems is half a tablet (3.75g) per day. Take half of one tablet just before bedtime. Zopiclone tablets are NOT recommended for children or adolescents under the age of 18. Does Zopiclone cause any side effects? Metallic or bitter taste in the mouth. You should follow the doctor’s advice on how to stop taking Zopiclone. Usually, the doctor will lower your dose before stopping the treatment. If you stop taking the tablets without first lowering the dose, you may experience withdrawal symptoms. Consult your doctor or GP immediately if you experience any of the following symptoms after you stop taking Zopiclone: headaches, muscle pain, sweating, stomach problems, relaxed grip on reality, nightmares, hallucinations, feeling anxious, increased sensitivity to light or faster or uneven heartbeat. Do not drink alcohol while taking Zopiclone tablets. Alcohol can increase the effects of this medicine and make you sleep very deeply so that your breathing becomes affected. While filling in the medical questionnaire, remember to include any other medicines you are taking. Zopiclone and Zimovane can affect how other medicines work, so it is important that you tell our doctors about all medicine you take. Remember to include any over the counter medication and supplements. Take the tablets exactly as the doctor has instructed you to. How do I buy Zopiclone online? To legally and safely buy Zopiclone online you need a prescription from a GMC (General Medical Council) registered doctor. Our online doctor service allows you to request a prescription through a medical questionnaire. Once you have chosen your medicine and submitted the questionnaire, it will be reviewed by one of our doctors. If suitable, the doctor will accept your request and a prescription will be issued. Below information is for your reference only. If you believe you may have developed an addiction, please contact your GP or local drug treatment service. You can find more information under the "More Information & Resources" tab. Take HALF to ONE tablet infrequently at night, the duration of treatment should be 2–5 days for transient insomnia. Short term use ONLY.